"The grand theater was letting out after its all-day kaiju movie marathon." Kaiju are a seeming inevitability of the movies are to be believed. Their creation is often a response to the way humanity abuses the planet and those monsters are typically presented as Earth's defense mechanism. 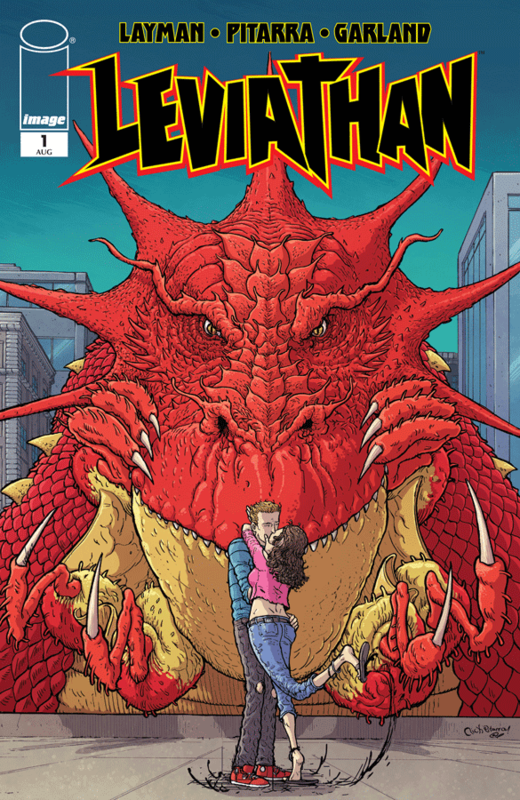 In Leviathan #1 from Image Comics, the arrival of a kaiju comes via a slightly different way. The issue is written and lettered by John Layman, illustrated by Nick Pitarra and colored by Michael Garland. The core of Leviathan #1 is a love story--one that doesn't seem like it would work at first even though Layman seems to pull it off. Layman ensures that Leviathan #1 plays out in a way that's extremely comfortable and methodic. And although the set-up is somewhat by the book, Layman fills it with characters who are very unique in their personalities and mesh well together for the sake of the story at large. What's also refreshing is that Layman works in a seemingly ridiculous set-up as a means of bringing in the kaiju--it makes complete sense given the personalities of the players involved. Layman isn't shy about leaning into the tropes of a kaiju story as well, but he doesn't completely rely on them as a crutch in that there's a few curveballs in the story. Pitarra's artwork is unsteady in a way that simulates the hand-cam approach that many disaster movies embrace. The characters themselves are defined by clear lines that are medium-weight, filling each page with plenty of action. What's really interesting about the artwork is Pitarra's approach to the panels and layouts; he eschews conventional formats for something more organic and chaotic. The kaiju in question is reminiscent of Godzilla which isn't necessarily a bad thing and Pitarra doesn't have to do much else to convey that kaiju presence. Garland's colors are very bold, with the kaiju in particular a bright shade of red reminiscent of the love shared by the two main characters. 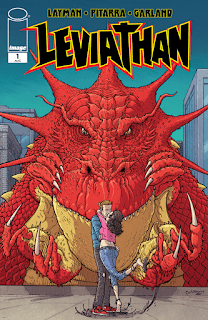 Leviathan #1 is a pretty breezy read that offers a new story about giant monsters. Ryan DeLuca is caught at the wrong place at the wrong time and all because he was trying to do the right thing. Layman's script is straightforward in its approach and hits all the right notes. Pitarra's illustrations are the right style for the book because they lend to the overall craziness of the scenario unfolding within the pages. Leviathan #1 is a slick read that pulls off being unbelievable and enjoyable at the same time. Leviathan #1 is available August 2.